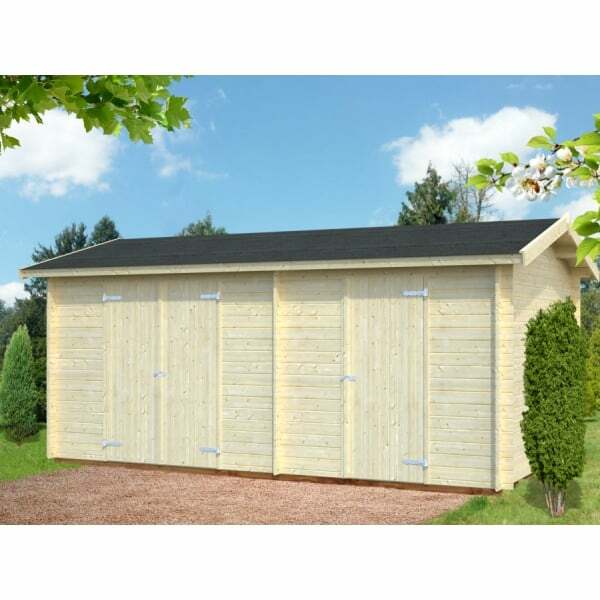 Palmako Jari 8.9m²: The Palmako Jari 8.9m/sq is suitable for smaller gardens but is still a great choice for a simple two roomed log cabin style building offering many potential applications. Each of the two rooms feature their own individual entrances with the larger room having a double door which allows you to be flexible in the use of space. As with the larger Jari this building has security in mind and therefore neither room has a window. The side room could be used as garden equipment or general storage whilst the larger room makes an ideal workshop or similar. The cabin can be built in “mirror” so that the small room is on either the left or the right hand side of the larger room. The Jari features high walls for good heard room yet still retains the max ridge height of 2.49m, which may under certain circumstances be required to comply with planning rules. The building is easy assembly, multi-functional, practical and attractive and offers lots of potential uses!